, a Florentine, first a monk and then a secular priest, died in 1574, at the age of sixtyone. He was member of the academy of the Peregrini, in which he took the academical name of Bizzaro, perfectly suitable to his satirical and humourous character. Some of his works are, 1. “Letters,” in Italian, 8vo. 2. “La Libraria,” 1557, 8vo. 3. “La Zucca,” 1565, 4 parts, 8vo, with plates. 4. “I mondi celesti, terestri ed infernali,” 4to: there is an old French translation of it. 5. “I martiii, cive Raggionamenti fatti a i marmi di Fiorenza,” Venice, 1552, 4to. In all his writings, of which there is a list of more than twenty in Niceron, he aspires at singularity, and the reputation of a comical fellow; in the first he generally succeeds, and if he fail in the second, it is not for want of great and constant efforts to become so. Dr. Burney gives an account of a very rare book of his, entitled “Dialoghi della Musica,” which was published at Venice, 1544, which the doctor never saw, except in the library of Padre Martini. The author was not only a practical musician and composer by profession, but connected, and in correspondence with the principal writers and artists of his time. Dr. Burney also remarks that his “Libraria” must have been an useful publication when it first appeared; as it not only contains a catalogue and character of all the Italian books then in print, but of all the Mss. 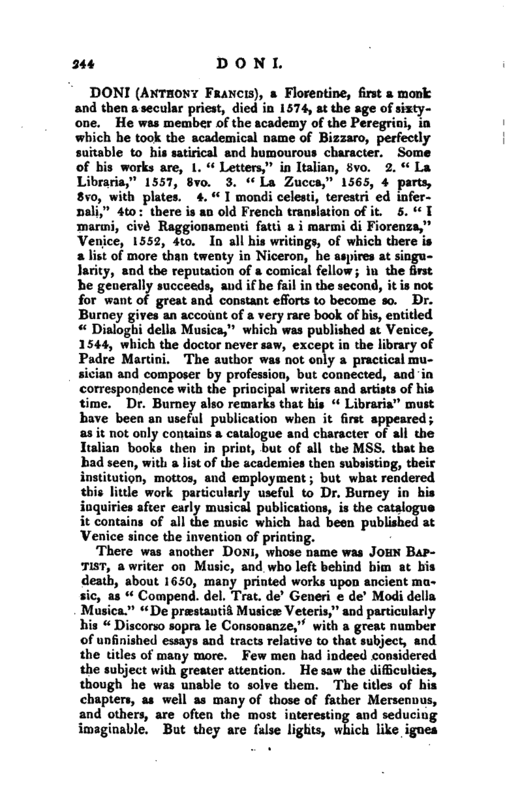 that he had seen, with a list of the academies then subsisting, their institution, mottos, and employment; but what rendered this little work particularly useful to Dr. Burney in his inquiries after early musical publications, is the catalogue it contains of all the music which had been published at Venice since the invention of printing. There was another DoNi, whose name was John Bap­Tist, a writer on Music, and who left behind him at his death, about 1650, many printed works upon ancient music, as “Compend. del. Trat. de‘ Generi e de’ Modi della Musica.” “De praestantia Musicse Veteris,” and particularly his “Discorso sopra le Consonanze,” with a great number of unfinished essays and tracts relative to that subject, and the titles of many more. Few men had indeed considered the subject with greater attention. He saw the difficulties, though he was unable to solve them. The titles of his chapters, as well as many of those of father Mersennus, and others, are often the most interesting and seducing imaginable. But they are false lights, which like ignes | fatui, lead us into new and greater obscurity. The treatises which he published both in Latin and Italian, on the music of the Greeks, being well written in point of language, obtained him the favour and eulogies of men of the highest class in literature. He has been much extolled by Heinsius, Gassendi, Pietro della Valle, and others. 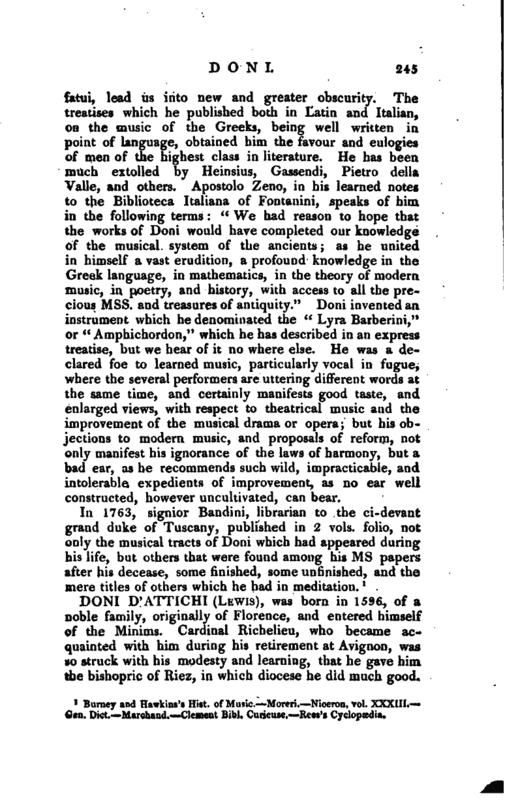 Apostolo Zeno, in his learned notes to the Biblioteca Italiana of Fontanini, speaks of him in the following terms: “We had reason to hope that the works of Doni -would have completed our knowledge of the musical system of the ancients; as he united in himself a vast erudition, a profound knowledge in the Greek language, in mathematics, in the theory of modern music, in poetry, and history, with access to all the precious Mss. and treasures of antiquity.” Doni invented an instrument which he denominated the “Lyra Barberini,” or “Amphichordon,” which he has described in an express treatise, but we hear of it no where else. He was a declared foe to learned music, particularly vocal in fugue, where the several performers are uttering different words at the same time, and certainly manifests good taste, and enlarged views, with respect to theatrical music and the improvement of the musical drama or opera; but his objections to modern music, and proposals of reform, not only manifest his ignorance of the laws of harmony, but a bad ear, as he recommends such wild, impracticable, and intolerable expedients of improvement, as no ear well constructed, however uncultivated, can bear. Burney and Hawkins’s Hist, of Music.—Moreri.—Niceron, vol. XXXIII.— Gen. Dict.—Marchand.—Clement Bibl. Curieuse.—Rees’s Cyclopædia.